A well-designed warehouse ensures you are achieving the optimal balance of cost, productivity, and space utilization while taking into account accuracy, throughput, and safety. I’m a firm believer in designing warehouse layouts that take into account the unique operational needs of each facility. I specialize in small to mid-sized warehouses. Most warehouses use relatively generic storage and material handling methods that –while they may get the job done—don’t truly optimize the operation. A custom solution doesn’t mean custom equipment, but rather a unique combination of standard storage and material handling equipment along with processes that are designed to meet the specific requirements of the facility. A custom solution should not only save money over time but may also be less expensive initially by ensuring the most cost-effective equipment is designed into the plan. This is an important point to make since I regularly see operations that have overspent on expensive equipment that will likely never pay for itself in their operation. Sure, it gets the job done and looks pretty cool, but it’s just not the best solution for that specific application. I work with clients to develop conceptual designs for storage, staging, processing and material handling areas. A conceptual designed is a scale CAD drawing that defines flows, types of storage equipment, aisle widths, work stations, etc. A “conceptual design” differs from an “engineered drawing” in that a conceptual design may not have the exact specs of the specific equipment (brand, model, specs) of the equipment you may actually use, may not exactly match your buildings dimensions, and has not been verified to work within your specific local building and fire codes. It’s meant to demonstrate possible layouts and equipment, which can then be used to create an engineered drawing (a service I don’t offer). If necessary, an engineered drawing with engineering specifications would generally be provided by the equipment supplier or an engineering firm after the initial conceptual design phase is completed. Slotting is the activity of determining the most appropriate storage location(s) for each item in your warehouse, and can have a significant impact on productivity as well as accuracy, safety, and quality. 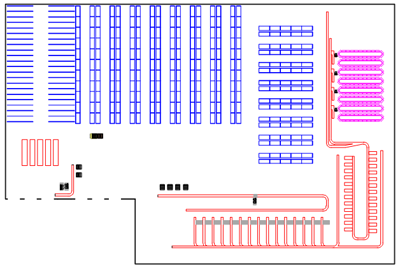 To properly design a storage layout or the picking and putaway methods used to move inventory into and out of the storage locations, slotting has to be considered. Slotting can get complicated, and I can help you work through the process of developing a slotting strategy. For more information read my articles on Warehouse Aisle Widths, Order Picking, and Warehouse Slotting. I can do quite a bit of this through E-consulting by helping you with design and layout concepts, slotting logic, and process flows. Or with providing a second opinion on plans you already have. Whether or not I can provide a detailed conceptual CAD drawing without a site visit depends on the complexity of the operation and physical space, and the availability of photos, measurements, CAD drawings, and data.